The Old Man of Damascus is a ‘script’ for Cthulu live, a game which I have – unfortunately – never managed to get in on a game of, though I have liked less physical LARPing and I love the Cthulu Mythos. Therefore I can’t particularly comment on the efficacy or appropriateness of the rules – not that many are presented in this product – and can only comment on it as a scenario, something I do have some knowledge of having been involved in many ‘wine and cheese’ LARP events over a span of nearly ten years. The Old Man of Damascus is an unholy alliance of Cthulu Mythos, Assassin’s Creed and The Da Vinci Code all rolled into one and put into a scenario in the period when Saladin was advancing into Christian territory and driving them from the holy land, before King Richard’s crusade. It is a period rich in secrets and religious fervour and a period also valued by conspiracy theorists due to the presence of Templars, the Vatican and the Assassins, all rich fodder for all kinds of conspiracy twaddle that also happens to make good games. I can’t give away a great deal without spoiling the plot for people who might play or organise such a game, but I’ll do my best. The setting for this ‘script’ is negotiation over the surrender of a fortress manned and protected by a contingent of Templars. Also present are merchants from a secret society with a very deadly secret, servants, priests and monks and the forces of the Muslim leader who is demanding surrender. On the surface this is a parley to determine the exact nature of this surrender and how it is to be conducted but under the surface each faction has their own secret agenda and these intermingle between the various forces at work. It’s a nice, tangled knot of interwoven motivations and goals that should be ideal for a one-off convention-type scenario. The book is not heavily illustrated or particularly interestingly laid out, there are a few medieval style woodcut images throughout the book as well as some photographs of players apparently playing through the scenario. I am not a fan of photographs in books, even licensed games from TV series or films tend to look poorer for having photos rather than illustrations and LARPers do not have the advantage of CGI, airbrushing or million dollar budgets to make their photos look good. I love gamers and LARPers I really do, but your average couch-jockey wearing a sheet does not inspire the reader and doesn’t evoke the mood particularly well. If you’re going to put photos of people in costume into a book it behoves you to make a really good effort on that costume and location in order to inspire the readers as to what they might be able to accomplish with a bit of effort. This was just lacking in this ‘script’. The writing is matter-of-fact and gets the points across, most of book is devoted to the character profiles and statistics of the assorted factions that are present. This is good as far as it goes and people have plenty of background and characterisation to get their teeth into, all very well researched from what I was able to tell, but it falls down as a LARP scenario by not particularly giving anyone any reason to share their secrets or any mechanism by which these secrets might be found out. There is a great deal of rich conflict and intrigue beneath the surface but I couldn’t find much of anything that might expose some of these secrets midway through the game and get the ball rolling towards a conclusion. It’s a fairly open ‘script’ which is good, but in such scenarios you still need something to prod the drama into happening and this was absent. While several endings were defined they were unsatisfying, particularly the ‘deus ex machina’ ending which, in the hands of a less able player, could result in a game-breakingly and mood-destroyingly bad ending. * No engine to propel the drama. * Many typos and mistakes. 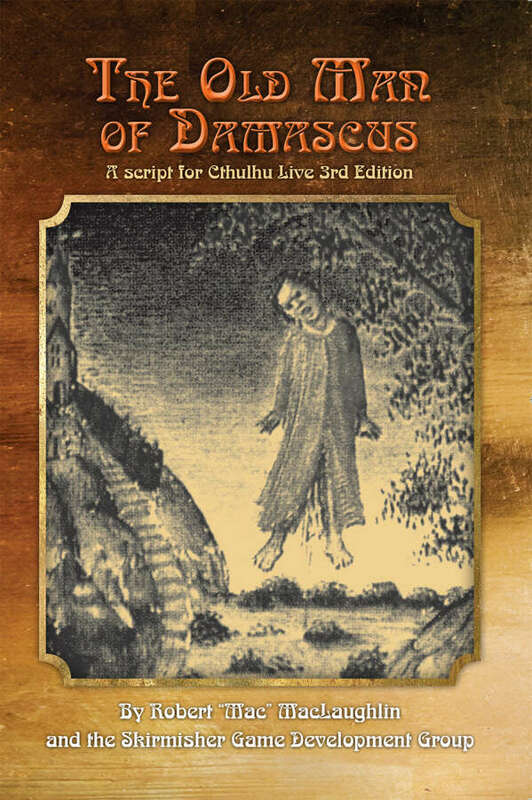 Look for more Cthulhu Live eBooks at the Flames Rising RPGNow Shop.